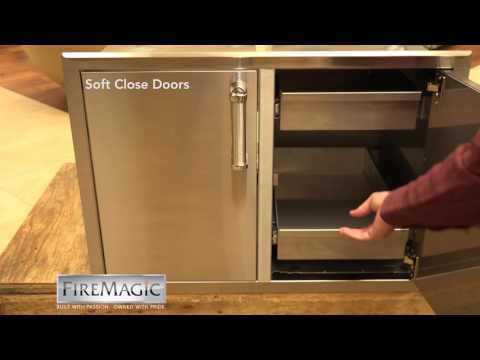 Complete your Fire Magic outdoor kitchen with their extensive line of quality stainless steel doors and drawers. This 36 inch access door with platter storage and double drawers features a sleek design with a left door hinge and handle that perfectly complements Fire Magic Echelon and Aurora series gas grills. The slim access door conveniently stores platters and serving trays for your outdoor kitchen. A strong magnetic latch ensures secure closure and polyurethane foam provides a solid feel and insulation. The flush mounting adds a clean, modern look while providing an efficient way to store grilling accessories and BBQ tools. This door and drawer combo is constructed from premium quality 304 grade stainless steel for lasting durability. Door hinges and drawer slides are equipped with a soft close feature that not only prevents slamming, but ensures a full and secure close every time. 36 1/2" 34 1/4" 29 1/4" 30 1/2"
18 1/2" 19" 19" 21"
26" 24 1/2" 24 1/2" 20 1/2"